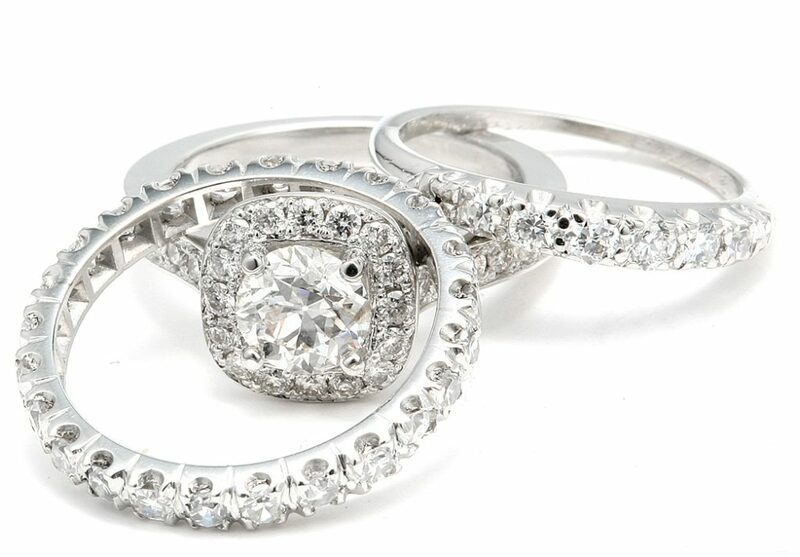 “Can my Eternity Band Rings Even be Sized? I was Told it Couldn’t!” I’m a jeweler in Santa Barbara. As a wedding jewelry design specialist I make a lot of eternity band rings. When you know how to make them, it makes it easier to figure out how to change them. I specialize in sizing eternity band rings. It’s not easy, I’m not gonna lie, but it can often be done. I’ll give examples and prices of eternity bands I’ve worked on later in this blog. Read my commentary on eternities or skip to the examples. Any time you have colored gems on the bottom of your ring they are going to get scratched up. Pretty soon they’ll look dirty to you all the time. Chances are that’s not dirt you’re seeing, but scratched-to-dullness you’re seeing. Those same colored gemstones when on the top side of a ring, get a lot less rough touches than the ones on the bottom. That is why you need to do more gemstone replacement with eternity bands than normal rings. See job #2. It’s the price we pay to wear our awesome and beloved eternity bands! What breaks my jeweler’s heart is hearing from someone that they’re not wearing their ring because one or more “jewelers” (probably uninformed sales people), have said, “it can’t be sized.” What they should say is, “I don’t do that.” But when a jeweler says, “it can’t be done ,” it sounds kind of final. I recommend that the next time someone says to you, “it can’t be done,” get a second opinion. Preferably from a jeweler who also designs jewelry. 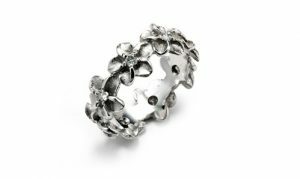 A jewelry designer understands how jewelry is put together and isn’t as stumped by the difficulties offered by an eternity band. Job # 1 – 14kt Yellow and White Gold Eternity Band – Restoration and Sizing. Cost of Work $750.00. 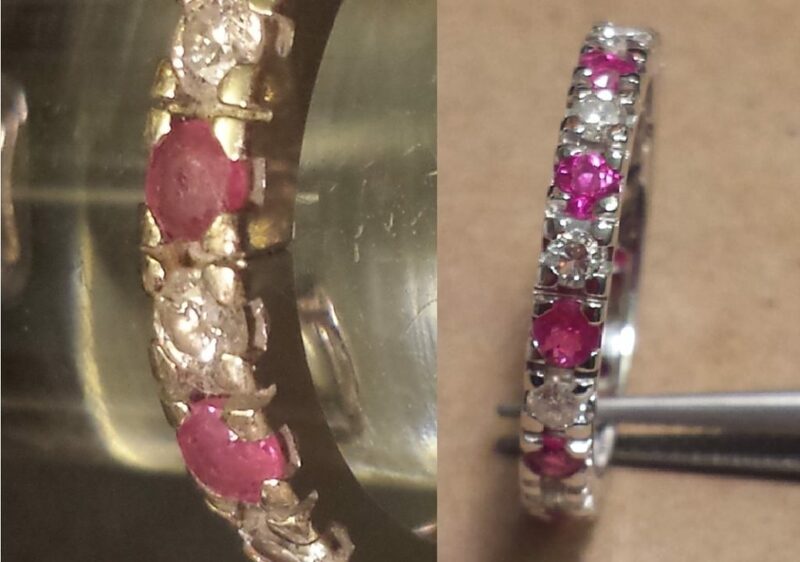 My lovely new client had worn her ring daily for years and there were many missing rubies. It also was so large on her that it could fall off if she shook her hand. She’d lost weight gradually and hadn’t realized how poorly fitting it had become. 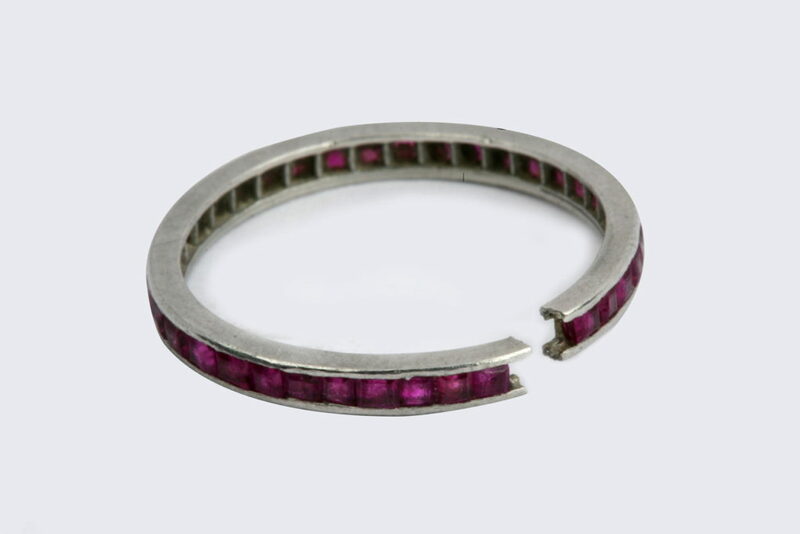 The work we did to restore it included two new yellow gold outer bands, new bezel settings and new rubies where others were missing, re-tipped prongs, sizing from 8 – 6 and did general gold repairs within the design itself. 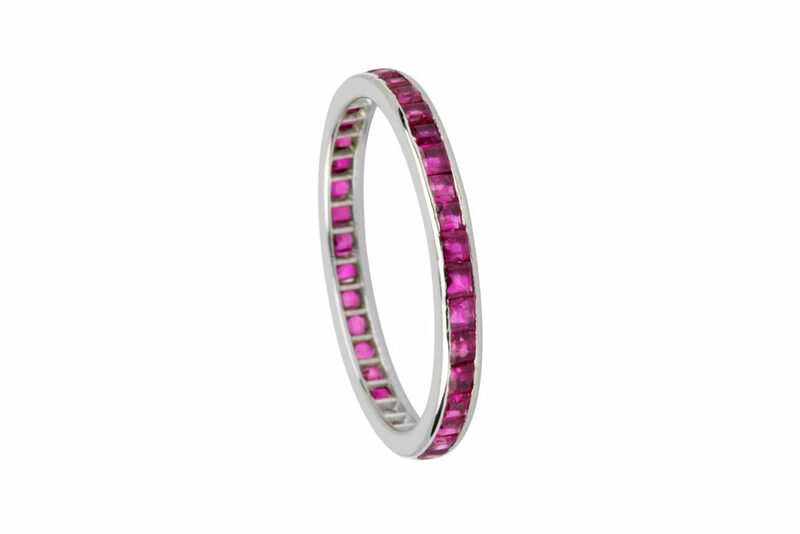 Job #2 – 14kt White Gold Eternity Band with Alternating Rubies and Diamonds. Sized and Replaced all Rubies. Cost of Work $460.00. This eternity band ring had been inherited and not ever worn by my client because it didn’t fit her. She was really excited that I could size it. We agreed that replacing the ten rubies would be a great idea. I also did needed prong re-tipping. I built a new white gold setting and added a new diamond. Where the work was done to enlarge her rings there are two diamonds next to each other. I sized her eternity band from size 4 to size 5. Job #3 – 14kt White Gold Eternity Band Sized two Sizes Larger and Added One Diamond. Cost of Work $255.00. This was a previously worn ring. It was exactly what my bride-to-be was looking for. She just needed it to be larger. Happily for her in going two sizes larger I basically added a section of setting and one diamond and it was a nice fit for her. 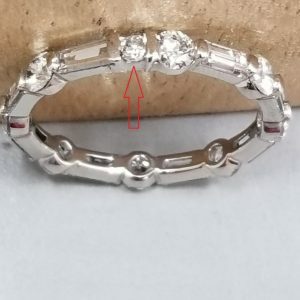 I needed to use laser welding to make the connections so as not to damage the surrounding diamonds. Laser welding with its lack of heat conductivity also ensures that any earlier solder points connecting nearby settings won’t be undone by heat. This was an inherited ring. It was too small for my client. She and her husband had tried a couple of times to get it sized and were told no. They visited me in Santa Barbara from Los Angeles to show it to me. The scallop style of curve downs between each prong were quite deep and were what made it so beautiful. It was a challenge. A new matching setting had to be created in wax, then cast up and placed securely and aesthetically in the ring. It was time consuming and technically challenging to make the connection seamless. We used laser welding for the connection. When it was all done I was really pleased with it. As was my long distance client. 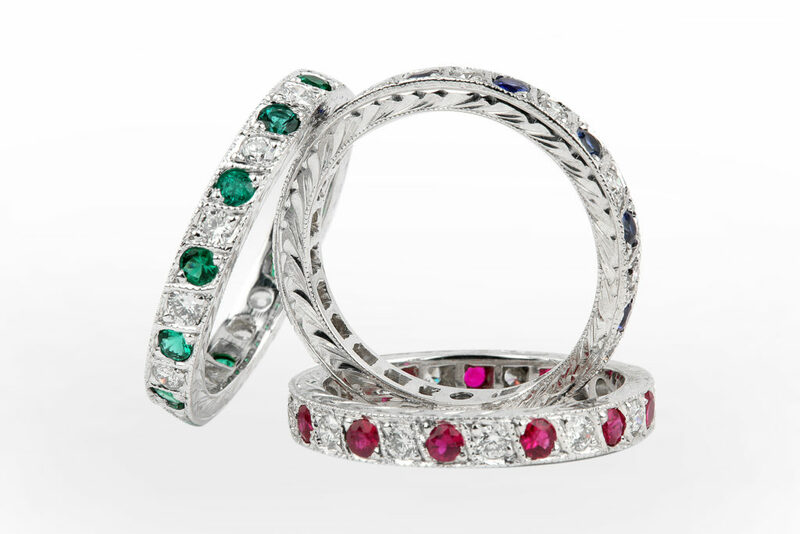 Custom Made Eternity Rings Pairing Diamonds with Rubies, Sapphires and Emeralds. Any of These Can be Sized. One of the nice things about eternity band rings is they look fantastic no matter how they turn around so if they are a tad too large it is not problematic. A ring that is half a size too large with a top heavy design is a problem and ring spinning can occur. With an eternity band, ring-spinning would never be a problem and so a half size too big is no biggie. Because we need to add or subtract gemstones to change the size, we can’t achieve an exact size. When I size a ring with a plain metal base, or bottom of ring, I can control the finished size. But once gemstones are involved they guide the finished size. I like to err on the too big, not too small side when sizing an eternity. If your diamond eternity band which is size five, has good sized diamonds in it and you want to go to size six, you likely won’t be able to. To enlarge it, using the same size diamonds may make it a six and a half or a five and three quarters. This is because of the size of the diamonds. Since your hands are more likely to get larger, go with the larger size option. If the size you need is not achievable, because the size of the added gemstone and setting is just wrong, a sizing bar of just gold or platinum can be made. When I’ve made these I often engrave them. It can make it harder to tell that there is no diamond there. I once made a tiny puffy heart in gold in the sized area and it looked fantastic. In job#3, above, she actually needed it to be 1.5 sizes larger. By adding one diamond it would be two sizes larger using the same size of diamonds she had. If she’d wanted to have it exactly 1.5 sizes larger I’d have had to make a plain gold sizing bar area to enlarge it. So How Much to Size My Eternity Band Ring? An all diamond eternity band is easier to work with as diamonds are tougher than other gemstones. Prong settings are easier to work with than channel settings or bezel settings. I’m not saying the more challenging gemstones and settings cannot be sized, just that they are harder. 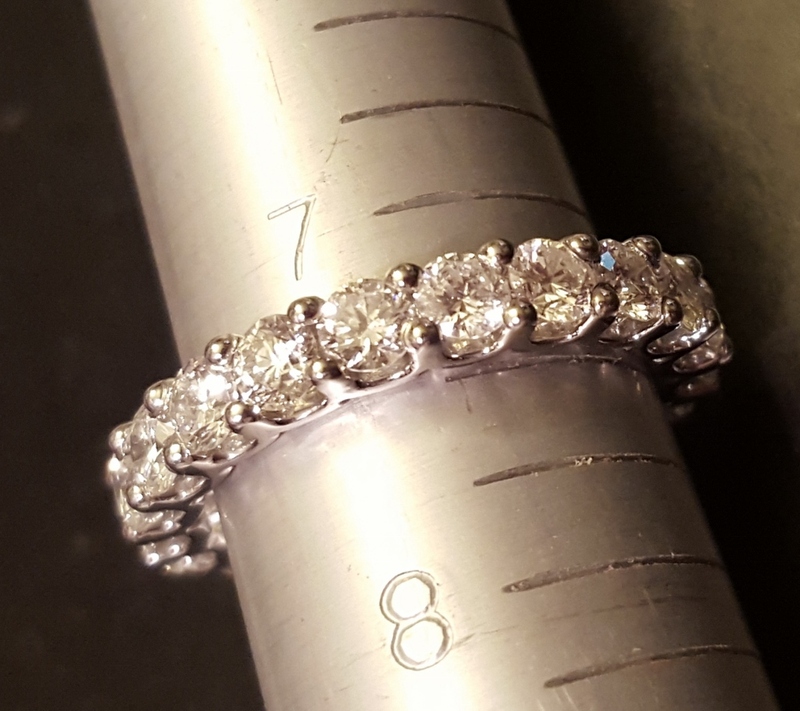 An average 14kt white gold diamond eternity band ring with 5 point each (1 point = 1/100th of a carat) diamonds prongs set, to size 1 size larger could be around $250.00. 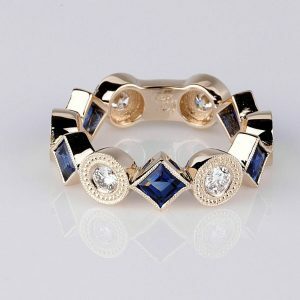 The same ring made 1 size smaller could be closer to $200.00. This is in no way a guarantee of the price you’ll pay. These example are here to give you a ballpark idea. Check out my other sizing blogs! So, in fact, they aren’t “eternity” rings if they can be resized? Just a little word playing with you. This is really interesting, and I bet a lot of people are really glad you wrote this post. That really drives me crazy when “it can’t be done” is used instead of “I don’t know how” or something similar. I’m thinking that people who get eternity bands maybe don’t know that their fingers will change. It seems like a way more expensive process to size an eternity band than a regular one. But if you’re wearing one it is like a tricked out sports car vs. maybe a Ford. One looks more fabulous and needs more care. And the other one is a car. I see why you’d want one! I wouldn’t mind an eternity band myself. Maybe we’ll just slip this link into an email for my husband. I like the fact that it symbolizes eternal love. Trying to find someone to size my diamond ring eternity band. I live in Oklahoma and can’t find anyone here that will. They say it can’t be done. I got married and my husband misjudged my size. My solitaire ring was sized down from 6 to 5.25, but the eternity band is the problem. I am a nurse, washing and using my hands constantly and athletic on days off riding my horse…the loose band is uncomfortable. Sizing down ( removing one diamond stone setting) would feel much better. Yes, a jeweler told me 800 at least. My ring is size 6 platinum with 22 pronged individual diamonds. 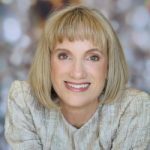 Do you perform work for out of state clients? 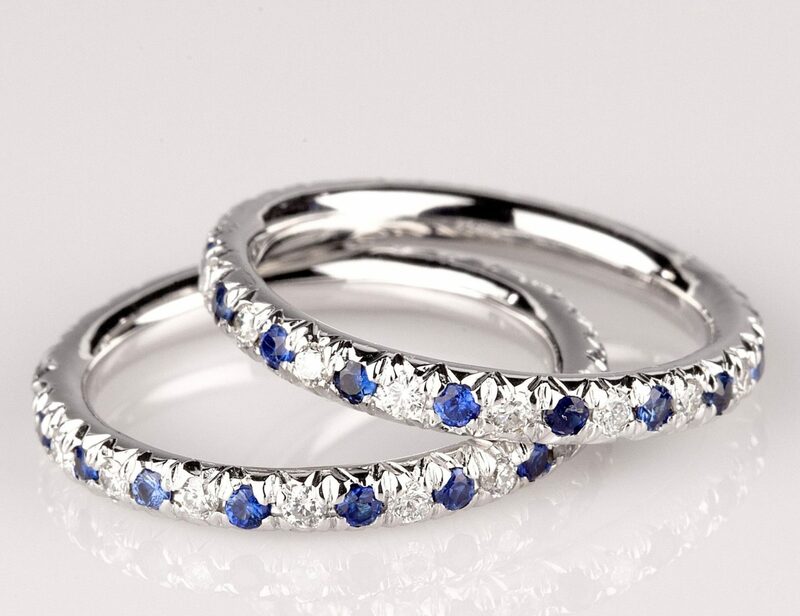 My wedding band is an eternity band of sapphires and diamonds set in white gold. Sadly, it is too snug and I haven’t ever been able to wear it, or find a jeweler who can help. 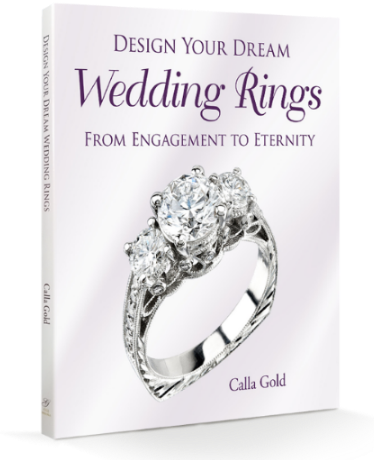 Thanks Calla for being so generous with your time on the phone today to discuss eternity ring sizing issues and options for remediation. Appreciate your expert guidance! Hi – I have sent all the required info for a sizing estimate. I have responded to your email back to me. Can you please let me know?